The choral ensembles at WSU present more than 30 annual performances on campus and travel throughout the Northwest and around the world. Recently, the WSU Concert Choir has completed international tours of Austria, the Czech Republic, and Russia. Additionally, the Madrigal Chamber Singers have toured Italy, including performances in Florence, Venice, and the Vatican. Choral ensembles at WSU have been invited regularly to perform at prestigious conferences. Vocalists regularly compete and rank as soloists in regional competitions. 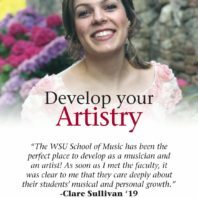 WSU graduates have a high rate of placement in music education positions and graduate schools, and have been accepted into prominent programs, including Eastman, Arizona State, and San Francisco Conservatory. Voice faculty members are in demand as adjudicators and clinicians, presenting at state, regional, and national conferences, guest conducting at festivals nationwide, and appearing as performers in companies such as the Boston Lyric Opera, Indianapolis Opera, and Sacramento Opera. Students enrolled in the Voice Studies Program have the opportunity to study with renowned faculty and perform in a variety of choral ensembles, including Concert Choir, Madrigal Chamber Singers, Opera Workshop, Treble Choir and Tenor/Bass Choir. In addition, classes are offered in vocal pedagogy, diction, jazz improvisation, vocal literature, choral conducting, and choral methods.